This wonderful Christian Steiner portrait of Charles Gerhardt(1927-99) featured in my 2007 post LPs were like the force of gravity. Gerhardt's important contribution as a conductor, producer and champion of twentieth-century composers such as Howard Hanson, whose Second Symphony is the main work on the disc above, has never been fully recognised. So I was delighted when David Cavlovic sent me a link to a wonderful appreciation of Gerhardt's work. Reading Robert E. Benson's memories of Gerhardt prompted me to dig some of his great recordings out of my collection, and to write my own appreciation below. Charles Gerhardt was a champion of the music of Erich Wolfgang Korngold, and collaborated with the composer's son George on recordings of his film music. 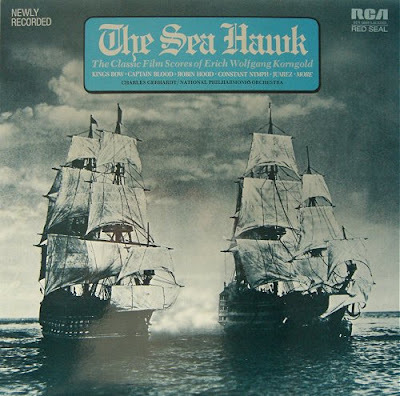 One result was the 1972 LP seen above conducted by Charles Gerhardt and produced by George Korngold, which is a true sonic and musical delight. At one time it was available as a Chesky CD transfer, but I can find no trace of it in the catalogue today. 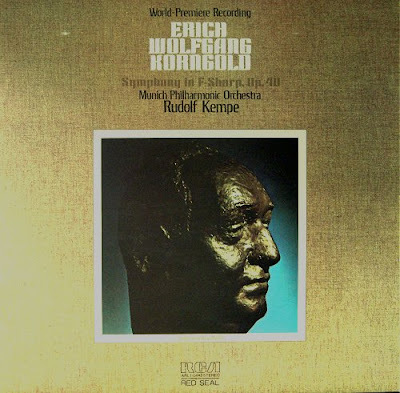 Another result of the Korngold collabaration was the LP seen below of the composer's Symphony in F-Sharp which Charles Gerhardt produced with Rudolf Kempe (another grossly under-rated musician) conducting the Munich Philharmonic Orchestra. Again there is a long-deleted CD transfer. This was the first recording of the Korngold Symphony, and it stands head and shoulders above later versions from other conductors. The playing of the Munich brass in the scherzo still makes the hairs on my neck stand on end. There may be more corn than gold in the symphony, but inspired playing like this can still make it sound like great music. One of the other conductors who subsequently recorded the Korngold Symphony was André Previn, who, to my amusement, has made several Korngold CDs for Deutsche Grammophon in recent years. When I was at EMI in the 1970s I suggested Previn consider a Korngold recording, but was told that, due to the conductor's Hollywood past, he did not want to be linked with composers of film music. Strange how locust years can change musical judgements. And, anyway, didn't Previn staples Shostakovich and Prokofiev also write film music? Just to prove every path has a twist, a few years later Previn took over tinsel town's own Los Angeles Philharmonic. His successor Esa-Pekka Salonen was less leery of film music, and early in his tenure with the orchestra made an excellent recording of Bernard Hermann's film scores. But back to Korngold. The bust of the composer on the handsome RCA dust jacket is by Anna Mahler, who was married for a short time to Ernst Krenek, the composer of the opera Jonny spielt auf. Anna's mother featured here recently, quite appropriately, in Mrs Mahler - may I take my jacket off? Charles Gerhardt also worked with Sir John Barbirolli, and their LP of Sibelius' Second Symphony is considered to be one of the great recorded accounts of the work. More Barbirolli in Glorious John in New York. I thoroughly agree with all your points in this “path”, especially how under-rated Rudolf Kempe was. Here was a German conductor whose recordings for EMI of Strauss is probably the best set of Richard’s orchestral music out there. I well remember the original HMV pressings. Some of the CD transfers fared well, but, again, Kempe’s legacy is woefully under-represented in the catalogues. Another solid Bavarian conductor is Wolfgang Sawallisch. I’m hard-pressed to find an interpretation of his I don’t like. I remember interviewing him years ago, when a particularly narcissistic German music critic took it upon himself to attack Swallisch’s credibility as a conductor with the Bavarian State Opera. Sawallisch took it with quiet dignity, and carried on with his work. Rudolf Kempe took over from Pierre Boulez as chief conductor of the BBC Symphony Orchestra in 1975. But he died, aged 65, the following year. I second the Strauss-Kemp-EMI comment above. Very nice box for the price. To follow down another Korngold path, you could try the 1995 CD reissue of Korngold piano music with Anton Kubalek (Citadel CTD 88109). Interesting stuff, mostly written when Korngold was very young (as young as 11). The CD is almost all of 2 LP's, one from 1973 and one from 1978. The connection to yet another path is that one of the LP's is the only recording produced by Glenn Gould for a pianist other than himself. I always thought the 1990's Welser-Most/Philadelphia Orchestra recording of the Symphony In F Sharp on EMI superseded the Kempe recording from the early 1970's. I readily acknowledge, however, that the more recent Previn/LSO recording of the same work on DGG resolutely failed to come to life. Does anyone have any thoughts about Korngold's (quite extended) Sinfonietta? I have never heard the work programmed, but I have heard the Dorian recording. I believe the bust is by Anna Mahler. Alma had many abilities, but I am not sure sculpting was among them! My mistake is now corrected. Drew, thanks for those interesting points. 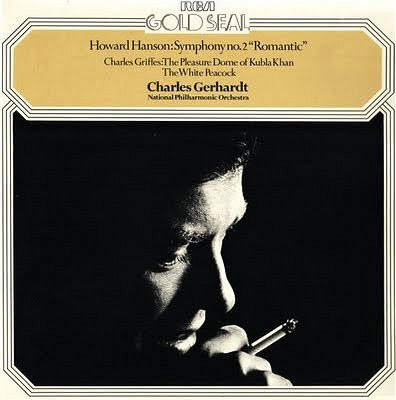 I have the Chandos CD of Korngold's Sinfonietta which plays as I write. (Chandos also recorded his Cello Concerto). The Sinfonietta (which is his Op. 5 incidentally) is an honest work, that deserves to be represented in the catalogue. However, for me it suffers to a greater degree that the Symphony from the failing that the musical argument is exhausted long before the end of the score. But that is a failing that Korngold shares with many better known names. I have not heard Franz Welser-Möst's account of Korngold's Symphony. But I am taking the opportunity to highlight another Welser-Möst recording that is well worth seeking out, his CD of Franz Schmidt's Fourth Symphony. It is deleted in the UK but, as I write, is in stock at Amazon.com for just $5.97. ...and of course, Korngold's post-war Violin Concerto was dedicated to Alma Mahler-Werfel, his neighbour in exile in Los Angeles. I was glad to read Nick's comments upon the Sinfonietta, as I was readying my own which closely mirrored the foregoing. Nick said it well, so I will only add that this work (begun when the composer was 14) is a magnificent manifestation of Korngold's young genius. I find no longueurs in the piece, excepting perhaps a spot in the finale; yet it is as Nick states, so thrilling to the point that any youthful excess is forgiven. Hearing three bars is all one needs to place its author, such is the individuality of the composer's harmonic and orchestration palette. I like many, was introduced to Korngold through Gerhardt's recordings, and I have been delighted to learn that he wrote even greater works than those bracing scores. Thank you for pointing us to the page honoring a terrific musician. Though I didn't find Welser-Möst's take on the Symphony compelling, I did find Previn's DG recording fascinating for the heft he gave the work. Kempe still rules though. It was good to see your enthusiasm for this wonderful record, which has always been a favourite of mine. I didn't ever have the LP but I bought the CD (a standard RCA transfer, nothing to do with Chesky) after the sadly missed Geoffrey Parsons enthused about it and played me some of the tracks. He had been told about it by Leslie Howard - so it has had some distinguished admirers. It has always sounded spectacular, and still does, even next to some of the best of today's SACDs. The playing is truly glorious - one wonders exactly which distinguished session players were making up the 'National Philharmonic Orchestra' that day - they were clearly having a ball. Incidentally I picked up at Gramex (a marvellous source of unconsidered trifles, rarities and bargains) Previn's DG recording, fortunately for only a couple of pounds. It sounds sumptuous, but he and the LSO sound half asleep - it's no match for the Gerhardt version. Incidentally, thank you for your Overgrown Path - always stimulating, sometimes infuriating and never dull - I miss it when you're on holiday!